High-quality spring ensures smooth opening and closing, enhancing the overall action of the caliper. Flat-leg design results in a measuring capacity approximately equal to the combined length of the legs. 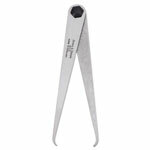 Caliper Type: Spring Joint - Inside; SAE/Metric: SAE/Metric; Size: 12"; 300mm; Length: 12".